I bike every day to work from Harlem (~137th Street) to 28th Street. The ride covers most of the city infrastructure for biking, from bike lanes to parks to the constant mass of vehicular insanity that is Midtown. Adam Clayton Powell (7th Avenue) from 155th to 110th has a layout similar to many Manhattan avenues. North and south bound traffic is separated by a median. Each direction of traffic has two lanes for moving vehicles, a bike lane to the right, and street parking to the right of the bike lane. 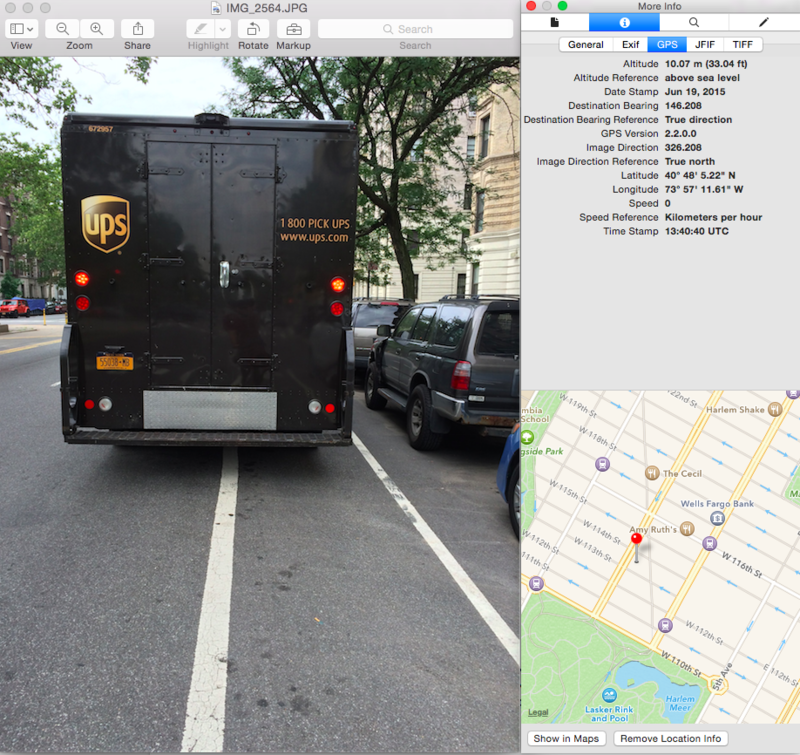 Most of the time in the morning, the bicycle lane on Adam Clayton Powell from 125th to 110th is blocked on every few streets by double parked vehicles, both private vehicles and delivery trucks. UPS trucks are a particularly frequent offender. Logic and experience suggests this is true for most of NYC. The reasons for double parking are many, but two obvious ones are the lack of available parking spots (perhaps because parking is free,http://www.perc.org/blog/why-parking-free) and the fact that double parking often goes unpunished. The double parked cars and trucks are a nuisance for drivers causing traffic to merge across the lanes, but for bicyclist they are a death trap. Forcing riders to merge into faster moving traffic from behind, pure murder. On June 19th, on my way to work I took a video and a picture of a UPS truck blocking the lane. 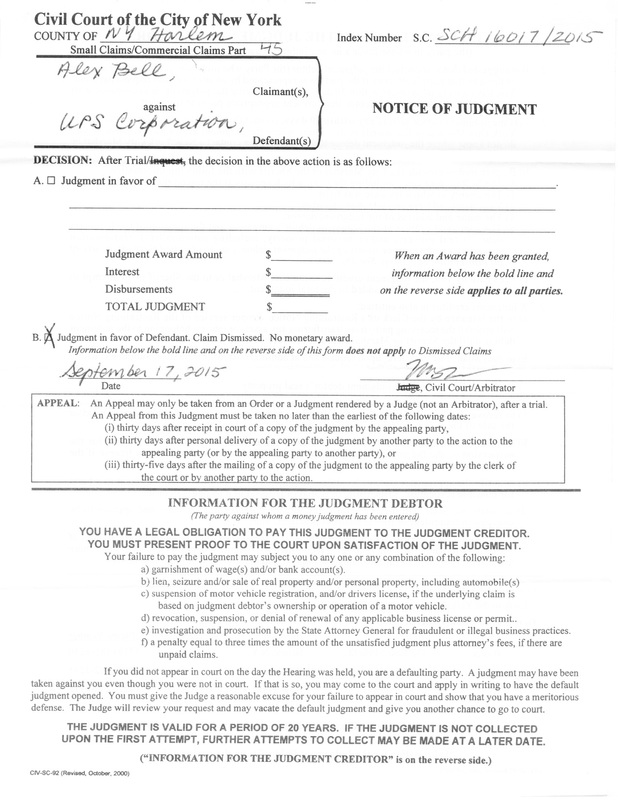 After some procrastinating, on August 3rd for $29.65, I filed a small claims lawsuit against UPS using https://www.turbocourt.com/. 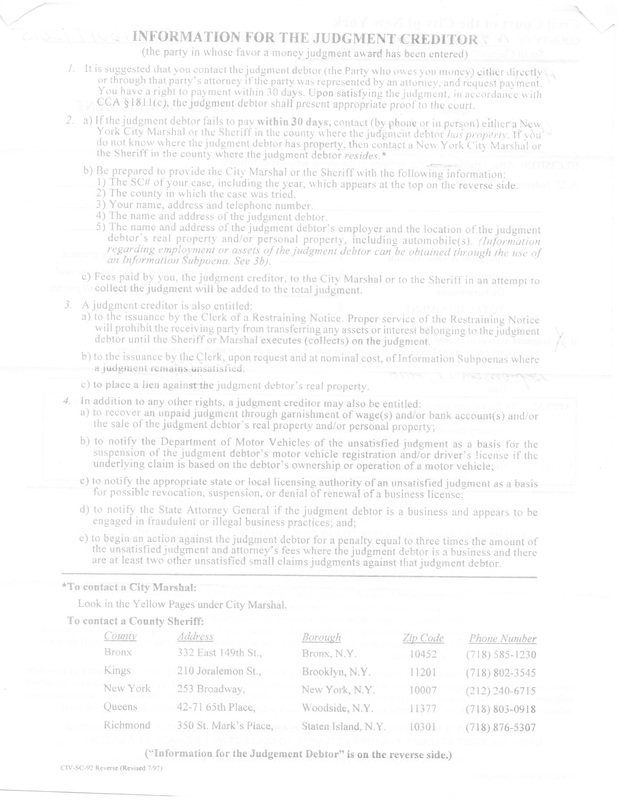 To file you need a NYC address for the person or corporation you suing. This was a little tricky as really I was hoping to just sue corporate UPS and definitely didn’t want to sue an owner of an UPS franchise store. I picked a address on 14th street that seemed to be some UPS sorting facility. The other issue was the amount of damages I was seeking. I had two options. Option 1 was to state that my life was put into danger and that I was suing for some kind of emotional stress etc. But reading through the court guidelines, I didn’t think this would go over so well. So instead I did Option 2, which was claiming $999 from having to buy a metrocard for the last 8 months because I couldn’t ride my bike to work. A few days later I got an email saying my court date was September 17th at 6:30 pm at Manhattan - Harlem Community Court (Address: 170 East 121 Street, New York NYC 10035, Room: 308). Probably a week or so after that I got a call from a UPS Security employee who called to ask about the case. I told him that I was suing because UPS trucks were blocking the bike lanes in Harlem. He said that he would be forwarding the letter on to corporate and that they would call me the next day. I also asked for an address for the UPS Corporation and he let me know that 643 West 43rd 10036, 6th floor was the best address in NYC for UPS Corporate. I didn’t hear from anyone at UPS for a few months until the Monday before the case. I called up the same number on 14th street to let the security employee know that I had not received a call back. The person there let me know that he had passed it along and if I hadn’t received anything most likely that meant they intended to just see me in court. Excellent. But on Wednesday, I received a call from Sean, security supervisor, at UPS. He asked what my complaint was and how he could address it so that the court case was not necessary. After I explained the situation, he let me know that he would work to talk to the driver and get that practice ended. He wanted to know if I could be paid some smaller amount to settle out or court, I said that my damages were $999 and that’s the number that was required. He was not super pleased and said he would see me in court. Showed up at the court, which is in a beautiful old building , at 6pm. The staircases are ornate gold (and are the location of the stairway scene in New Jack City with Wesley Snipes, according to the court officer) and the actual courtroom features two walls with WPA murals (covered, says the same court officer, for objectionable depictions of bare breasts and slaves). The courtroom is also kept at sixty degrees and after 3 hours of sitting in shorts and a tshirt feels like a torture chamber. Promptly at 6:30 PM the clerk explained that during the roll call of the cases for tonight, the defendants and claimants should announce whether they want to be heard by a judge or an arbitrator (https://www.nycourts.gov/courts/nyc/smallclaims/volunteer.shtml). If you choose trial by court, you will most likely not have your case heard that night and would have to return. The arbitrators are experienced lawyers who volunteer to help the court. I decided to go with arbitration and responded so during the roll call. While waiting, what turned out to be 2 hours for my case to be called, I got to listen to some of the other cases being heard by the judge. Sadly, unlike traffic court, you can’t clearly hear what the judge and participants in the other cases are saying. I did manage to overhear one case involving Country Wide Insurance and an auto body shop owner over some rental car payments, which was settled with Countrywide paying $200 of the claimed $900. There was also a failed attempt by a woman to sue McDonalds over a breakfast sandwich which she claims made her sick enough to miss work and hence was owed $5,000 in lost wages. The problem in the case, as was repeatedly said by the judge in a perfect Judge Judy homage, was that the claimant could not prove that it was the McDonald’s sandwich which had caused the illness. The claimant’s complaints that she “only ate McDonalds” didn’t see to sway the judge as much as it did me. My name was called and the UPS representative and I went to the fourth floor. This was my first time to see the UPS rep, who turned out to be none other than Sean, the Security Supervisor I had spoken to on the phone. My guess would be 35 years old and a resident of Long Island. He didn’t look super happy to be in East Harlem at 9:30pm, as the case began, he did not get happier. I described that over the previous eight months I was prevented from riding my bicycle to work by a seemingly constant presence of UPS trucks blocking the bike path in the weekday mornings. Because of that and the danger it posed to my life, I was suing for the cost of the metrocards which I had been forced to purchase. Sean’s first response was to ask whether I had contacted anyone at UPS, because he had found no evidence I had. Sean suggested that if only I had contacted them, the corporation would have remedied the situation to prevent an injury to their image. Sean tells me that UPS is very concerned about their image. I told him that I had contacted them and as you would expect if you aren’t calling about a lost package they don’t care. His next statement was that the drivers always tried to park legally, but sometimes they just couldn’t. To that I asked how it was easier to swerve into a bike lane in order to stop rather than simply stopping in the lane. This seemed to not compute and produced my favorite line from Sean which was, “do you know what kind of precedent this would set?” To which I smiled and said YES. UPDATE: Started New York Supreme Court Case, stay tuned.